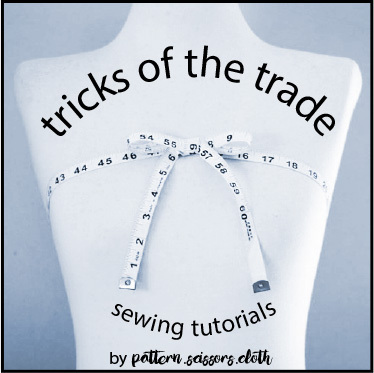 Welcome to the seventh edition of 5 Sewing Tips! I’ve been reposting these little tips that have been hiding long lost in my blog since September now – I hope you are enjoying them as much as I am enjoying putting them together. This month is all about cutting bias pieces, sewing a neckline facing, my favourite fusing, selvedge puckers, and blockfusing. 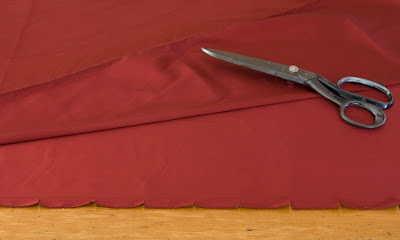 My best tip for cutting bias pieces is to ensure that the lengthwise and crosswise grainlines are perfectly straight and perpendicular to each other throughout the whole piece of fabric. To do this you need a large cutting area – which is why you can see floorboards in this photo! Some might frown, but this is far superior to fabric hanging off the end of the table, pulling the grain out of alignment. Also, merely eyeballing the grainline arrow is risky when your pattern piece is laid at an angle – always measure from the selvedge. I’m amazed how far out my placement can be when I try and guess! This is the fusible interfacing that I use the most – a lightweight knit. I highly recommend it for the home sewer as it bonds readily with a domestic iron (a lot don’t). I use this lightweight knit fusing on everything from jackets to georgette. It is great to use on stretch wovens where you wish to retain a degree of stretch, and provides just the right amount of body for most of the garments I make. I always keep plenty of black and white on hand. Take a few seconds to clip the selvedge at intervals to release the tension – you’ll have perfectly flat fabric in no time, and more accurately cut pieces! Do you blockfuse your collars/cuffs/facings/bits and pieces yet? If not, you don’t know what you are missing, and urgently need to click the picture below. That’s it for this month! Hope you found something to help you in your sewing. Do tell me though – do you blockfuse your fabric or not? I love blockfusing! I just can’t believe it took me so long to discover it. Would you be able to tell me where you source your knit interfacing? 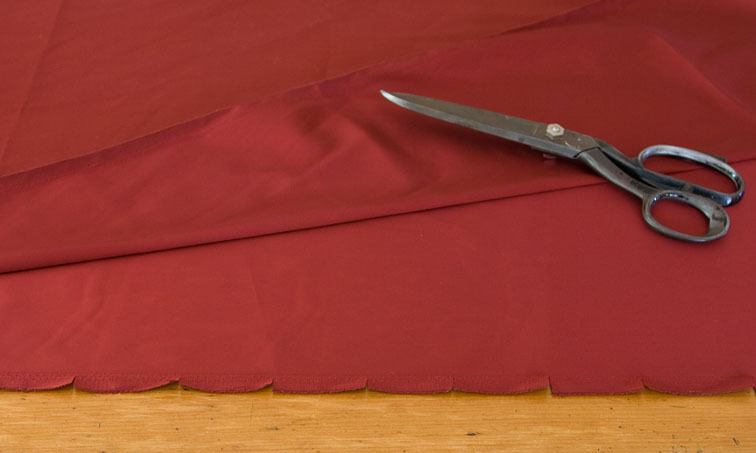 I have a lot of trouble finding appropriate interfacing and would much appreciate the tip! Hi Siobhan – so many people have asked for this that I will dedicate a post to it shortly! I would block fuse when I didn’t know what I was doing because I was lazy but here it is; I was clever! I have brocade fabric from the ’60s from my Mum’s stash and it has the little cuts along the selvages but I always thought it was to get it off the mill. Love the tips especially the facing one – makes perfect sense when someone shows you. Haha – so it was you who invented blockfusing! 🙂 It does make perfect sense though, and gives perfect results. I always forget to do the facing one until it is too late! I’ve seen my sewing students trying to fuse a shirt collar and collar stand individually and its very tricky to get it perfect and on grain. Great idea to use the scraps for applique! Ooh a great bunch this month! So with the neckline facing tip you mean leave that bit unsewn on the facing only? You leave it unsewn on both the facing and the body. It is good for necklines with a sharp turn between front and back, like a boat neck. I usually forget to do it and kick myself later! Yeah carpet is no good for cutting out on (mind you it is probably better on the knees!). I always line the selvedge with the floorboard to get it straight – tiles would be handy for the crossgrain! The lightweight knit fusing that you recommend- is it a specific brand or just this type works well for you? Thanks Hedgewick – I’m going to do a post on fusing shortly, since so many readers have asked! I have blocked fused and it is easier for sure. 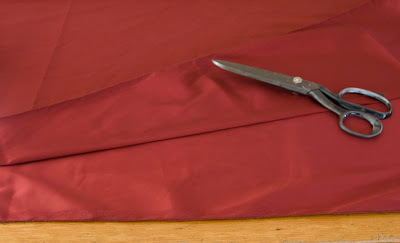 With the shoulder seam tip, do you not sew the end on both the garment and the facing or just the facing? Hi Vicki, you leave the end unsewn on both the facing and garment outer – less clipping! It does work best on necklines like a boat neck or other angled turns at the shoulder. Would love to know which brand/type of interfacing you use – I have yet to find one I love… thanks! Thankyou Sheryll for all these tips, I will block fuse from now on it seems much quicker and more accurate. I also would love to know what interfacing you use. Quite a few I have used don’t fuse completely, or may be I haven’t used enough heat/pressure. Thankyou again for all your tips. Since a lot have asked, and I have a bit more I want to mention about fusing too, I’m preparing a blog post on this! Thanks for the tips. i can’t wait to try number 1 and 2. I already do blockfusing and i really love doing that. I also use lightweight knit interfacing alot but I nees to stock up on those. Ditto on identifying the specific brand/type of knit fusible you use. I also struggle with bonding. Blog post on this coming shortly Heather! I’ve heard only good things about fusing from Fashion Sewing Supply, but yes it’s so far away! Hi Lyn – I’m going to do a more detailed post on this topic soon! Hi Sylvia – quite often the hindseam of the sleeve does not match the princess seam of the coat back – could that be where you are going wrong? Chiming in another Kiwi voice who would love to know where you get/what interfacing you are recommending!! It’s so hard to find good quality interfacing here..
Hi Ana – because so many have asked the same thing, I’m preparing a blog post on this – hopefully not too far away! I love these tips! I have a question on tip number 2: would that work on the point of V necklines which have a facing as well? I always struggle to get them laying flat. These are some great tips–thank you! I love blockfusing. I used to hate interfacing until I started blockfusing. It’s so much easier to deal with the floppy interfacing as one large chunk than to cut your fabric, cut the interfacing and try and have them be the same size and then fuse them. Plus now, I take my block of fused pieces with me in the car to trim up while I’m waiting in the carpool line–saving my precious sewing time and using up unused time too!